At the turn of the twentieth century, a variety of artisitic movements took place in Europe. Accompanying such a trend, a number of magazines of fine arts were inaugurated in various European cities. Waseda University Library owns several such titles. From among the collection, we present here the German "Jugend", published in Munich. 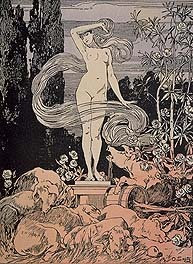 First appearing in 1896, "Jugend" was a general illustrated weekly magazine launched by Georg Hirth (1841-1916); its puclication continued until 1940. Despite meagerness of each of its issues, composed of not more than 20 pages, the magazine enjoyed a spectacular success in turn-of-the-century Munich; with the novel and fashionable covers in a lithographic tone, it lavishly incorporated ample information on the clothes in vogue extending in Europe, witty caricatures, and advertisements of newest goods on the market. 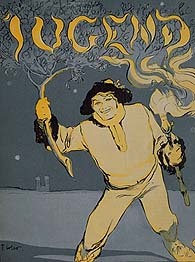 The artistic movement "Jugendstil" owed its name to the "Jugend" magazine. Jugendstil literally means "style of youth" in German, and generically indicates the creative activities carried out in Munich by the young artists from the mid 1890's through around 1907. The artistic movement known generally as "Art Nouveau" spread to Germany and Austria, where it ended up being called by the German word. The artistic activities of the period, encompassing fine arts, architecture, furniture, handicrafts, bookbinding, poster designs and fashions, are summarized as "fin-de-siecle" (end of the century) arts. They are characterized by flowing lines and flat-looking decorations; such traits show up in not a few illustrations inserted in "Jugend". Literally means "new art". The movement occurred at the end of the nineteenth century in England, Belgium and France, then it extended to Germany and Austria. Characterized by sinuous lines reminding of branches or ivies. Representative artists are: Mucha, Klimt, Galle, Gaudi etc.